The hostel is newly open, safe , clean and with friendly staff. 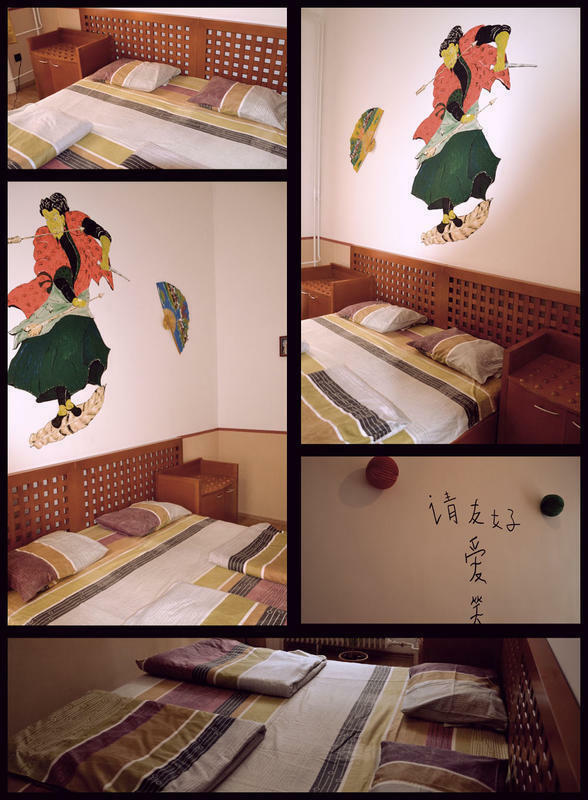 We are welcoming our guests in designed themed rooms wich represent different culture. Coffe and tea is available all day. Take the Bus 200 E till Kobanya-Kispest,and then change with Metro line M3 (blue) till Corvin Negyed,and then change with Tram No 4-6 ( yellow) till Rakoczi Ter. Our gate is in front of the tram station,between the CBA supermarket and a library. Take the Metro line M2 ( red ) one stop till Blaha Lujza Square,then change with Tram No 4-6,one stop till Rakoczi Square. Take the Tram No 4-6 till Rakoczi Square. Take the Metro line M2 ( red ) till Blaha Lujza Square,then change with Tram No 4-6,one stop till Rakoczi Square. Take the Metro line M3 ( blue ) till Corvin Negyed,then change with Tram No 4-6 till Rakoczi Square.